The campaigning is now behind us and Team Katie is taking a well-deserved spa day. All that door scratching, rebel rallying and kitten kissing has really taken it's toll. 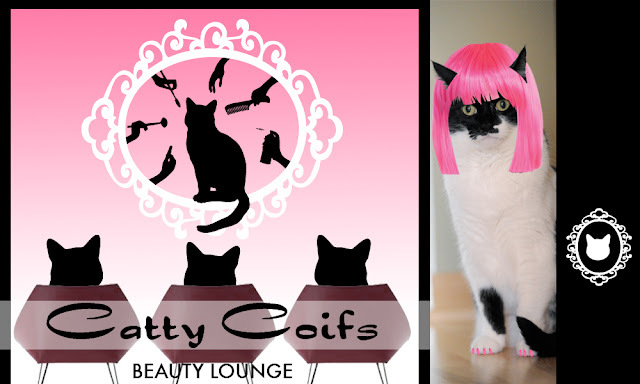 With today's PhotoHunt theme *HAIRY* as inspiration, we're spending the day at one of our favorite hangouts: Catty Coifs. Nothing beats a full-body biscuit massage and a French mani-pedi. Ok, truth be told Cathy Keisha would't let that nail tech near her with a 10' wand toy. But the salmon infused spring water was divine. I'm not entirely sure about this new DO. Can I even blog with these nails? Oh wait, I've still got Waffles the intern to boss around. Don't say anything...but Waffles doesn't realize the campaign is over. On behalf of Cathy Keisha, Waffles and me, I'd like to thank everyone for their love and support during the Campaign For A Cause Contest. We had a lot of fun and hope you did too. Best of all, we had a chance to introduce you to the kitties of Blind Cat Rescue. They mean the world to us. I know what you're thinking. 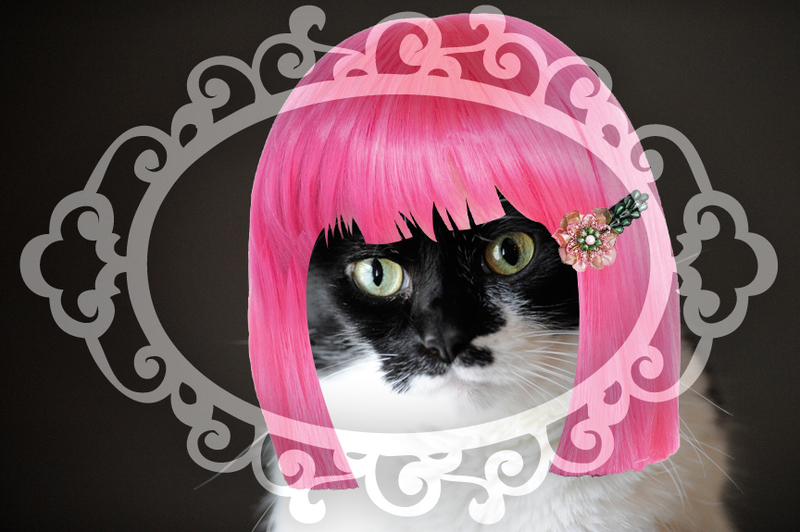 How can a cat in a pink wig rule the world? I guess we'll just have to wait and see. Now I know where Lady GaGa is getting her new look ideas from! Katie, you and your campaign buddies Rock!!! Oh Katie, you are really pretty in pink. You deserve a spa day after all the campaigning. You definitely earned your spa day, Katie! We love the pink wig, it's very "Katie Perry"! MOL! Maybe you can take a spa day, but I've got a virtual book signing to do! Never a moment's peace around here. Stop by if you have time between 1 and 4 pm Pacific Time on Twitter - the hashtag is #DearSparkle and we're giving away a copy of my book! Oh wow, you make a spa day look like a wonderful thing. When mom says "spa day" it means the claw clippers are coming out and we all run! You make us think spa day might be good even though it involves water and soap! Why, that pink wig is better than a CROWN! We love your pink wig Katie it looks wonderful with your furs. Love the three of you all coifed up! We think a spa day was a great idea!!! We love the pink wig! I will have to tell Callie about this place when she returns, although she is pretty devoted to her favorite spa here in Dallas. It is a holistic massage and tanning place combined. It is called the "Shake and Bake" Spa. Oh Katie - I sure am jealous... I would love a spa day and would even trade in the leopard ears to wear that divine pink wig as long as it meant a day of pampering!! But, to be clear... once the pampering is over, the leopard ears go back on!! Enjoy your day - you deserve it after such and exhausting campaign! Katie, if me takes yous for a ride in my Nelliemobile, can me wear your wig? She looks lovely, but we can stop thinking about the salmon-infused spring water. Yum! Did you really think I was gonna let anyone touch my nails? No one comes near the claws of Sasha Fierce!! BTW, I love the pink wig. Wednesday on Twitter, everyone wears pink wigs to show solidarity for animal suffering. One of my favorite cats wears a pink wig over at Furrydance! :) She rocks the outfits too! Beloved Miss Coco. She gets surrounded by her BoiToi crew of Mr. disco & Sir Brighton! You are looking mighty cute in that pink bob! Well actually we love the new do. Team Katie deserves a spa day! Katie...that pink hair becomes you!! Y'all are looking mighty fine! But that's normal....ya always look wonderful! 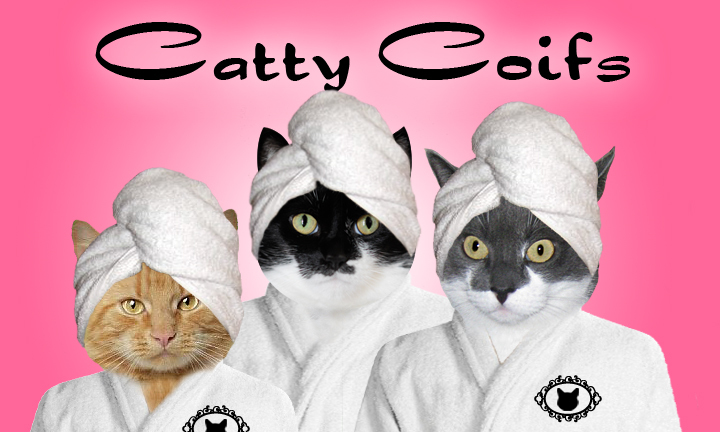 That first photo of you three in the spa towels just cracked me up! Allie: *squee! * I KNEW I could get you into pink nails!!!! Oh my gosh. what can I say. The Spa photos have me smiling and laughing. LOVE THE WIG! My Geisha, my supermodel kitty, who actually does wear accessories, is quite envious right now. But Layla (from Cat Wisdom) had a great idea--how about a tiara? Oooh but that would mean a beauty contest. Now that would certainly mean a cat fight. Let's all rest after that exhausting Cat Ruler contest. So much fun! Can't wait for the results!